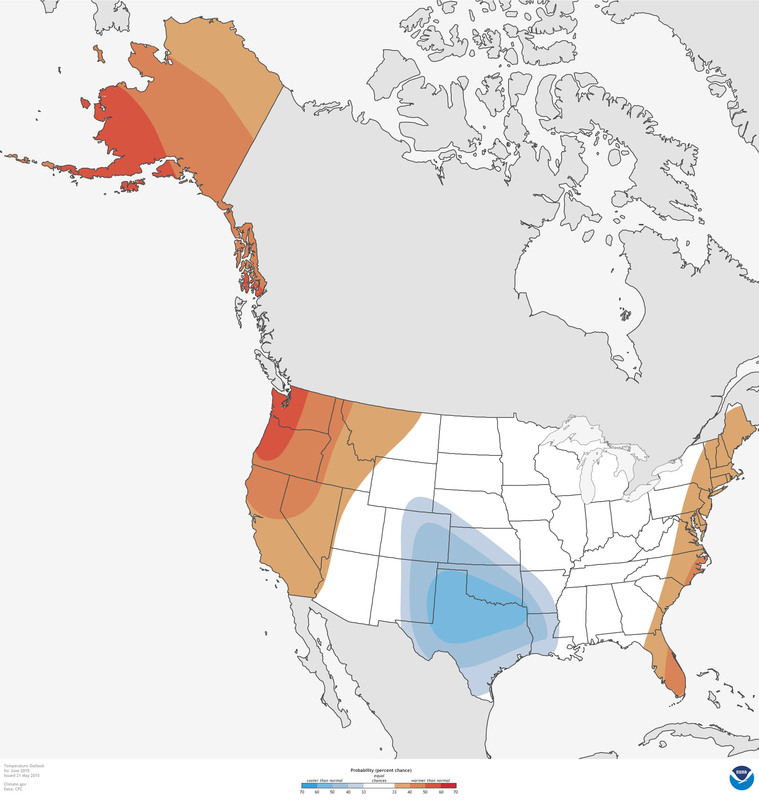 The warm waters in the equatorial and northern Pacific off the West Coast and the water-logged soils in the Southern Plains are some of the factors influencing the temperature precipitation outlooks for June 2015. 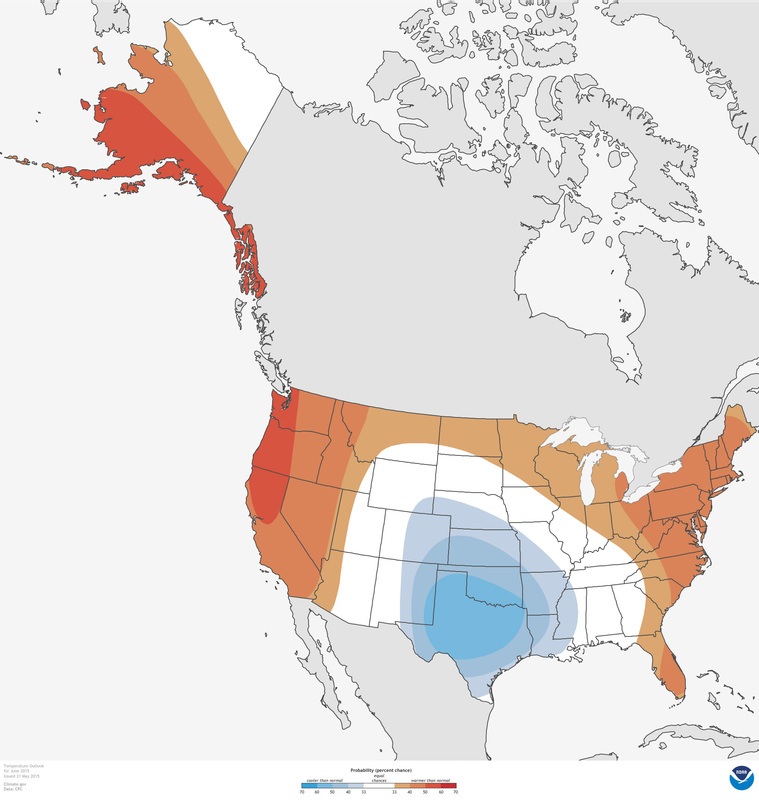 Colored areas on these maps show the probability that June precipitation (left) and temperature (right) will be well-above or well-below average (in the upper or lower third of the historical June conditions). Darker colors mean greater chances of a given monthly outcome, not a larger temperature or precipitation anomaly. Areas that are white are places where the chances of above-, below-, and near-average conditions are equal. According to the latest outlook discussion from NOAA’s Climate Prediction Center, the elevated chance of relatively cool conditions in the Oklahoma and Texas are linked to the incredible amount of rain in the region in May. Wet soils tend to cool temperatures off. The Pacific waters off the West Coast of the United States and south of Alaska are warmer than normal, contributing to the outlook for above-average warmth “downstream” over land. In addition, a wide swath of western North America, from Alaska southward into northwest Mexico has been unusually warm since since January. The broad band of elevated chances for well-above-normal precipitation across the heart of the country may be good news for drought conditions in the Southern Plains, but will hardly be welcome to those areas that experienced record-setting rain and floods in May. Maps by NOAA Climate.gov team, based on data from the Climate Prediction Center. Additional outlook maps are available via the Data Snapshots section of Climate.gov.